The stress has come and gone and Christmas is over. As you go through your gifts you might see some that aren’t your style, don’t fit, are duplicates of something you already have or something you just don’t need. You don’t need to have them sitting around your house collecting dust in the back of your closet. Christmas is also a financially difficult time of year, and you might need to get some cash in your hand along with another type of assistance such as a car title loan to use toward your debt. Consider turning your unwanted Christmas gifts into cash and use it for something that you really want or need through one of these five ways. One of the most common things to do is to return the item you received back to the store where it was purchased. It helps to have a receipt when returning something to avoid receiving a lower price than what was paid or being limited to store credit for the amount of the return. Stores tend to have more lax return policies around the Christmas holiday and take items back for longer time periods than usual. Don’t take too long to return the item or you might get stuck with it if you end up trying to return the item after the specified time frame. If you do end up with a gift card and don’t anticipate using it, read on to see how you can turn them into quick cash. Trade your gift online through one of the many trading websites and services available. Sites such as Cardpool, allow you to trade or sell gift cards to others. Trade your gift card for one to a business that you’ll patronize, or sell it for cash. Depending on where your original gift card is for, you can typically get back up to 90 percent of its value. You get rid of the gift card and the recipient gets a small discount on their purchase. It’s a win-win for everyone. PaperBackSwap is a book lover’s dream. You list your unwanted books and earn credits to get books others are looking to get rid of. Gamers benefit from Game Trading Zone to swap games and accessories with others interested in gaming. It makes sense that selling your items can give you cash quickly, but it helps to understand where your item will sell quickest and give you the most money. Don’t expect to get the full value of the item, because buyers want to find a good deal, but you can still get some cash from the item. Craigslist is a quick way to sell items without needing to pay listing fees or worry about shipping costs. Always meet people you meet from Craigslist in a public location for safety reasons. Other sites, such as Poshmark, allow you to list accessories and clothing that you don’t want. You’ll appeal to a large pool of buyers looking for your items, but keep in mind that you’ll be required to pay small fees in exchange for listing your product on their website. eBay is another site with millions of users. You can sell pretty much anything and everything on eBay, but keep in mind you have to pay a listing fee along with a seller’s fee, which is a percentage of the sale price of your item. OfferUp is an app only service that allows people to buy and sell items to individuals in their local area. It requires parties to meet in person to exchange items, which saves on shipping costs but stay safe by always meeting up in a public location. Indirectly get cash by saving the item and giving it to a friend, family member or coworker who you feel would benefit from it. Clothing you got might be too small or large for you but would probably fit someone you know perfectly. Keep in mind who gave you the gift so you don’t embarrass yourself by trying to give it back to them or someone you mutually know. There’s no reason to leave unwanted Christmas gifts lying around when you can turn them into cash while helping someone else get something they want at the same time. Halloween is fun for kids of all ages, including adults who are kids at heart. However, what isn’t so fun is the hefty price tag that often comes along with the fun-filled day. In fact, a “new poll from the National Retail Federation projects that Halloween revelers will spend. . .an average of $82.93 per shopper” (USA Today) this year. That’s more frightful than the Halloween decorations that may cover your yard. Use these tips to help you save on Halloween spending this season so you can still have a fun Halloween without breaking the bank. There are plenty of ways to get Halloween decorations for a fraction of the cost. My favorite way is to buy Halloween decorations at yard sales. (In fact, that’s how I buy all of my decorations!) Or, if you have patience and would like to buy new, you can check out the clearance sales after Halloween is over. That’s how I bought a good supply of Halloween and fall-themed towels, at more than 75% off. Halloween costumes bought new can cost anywhere from $25 to upwards of $100 for fancier costumes. Yikes! We have three kids, so to spend that kind of money on costumes is not practical. Instead, we employ a variety of strategies to save on costumes. My son went as a knight one year. We found the vest at Goodwill for $5. We pared that with black pants and a white shirt that he already had. Then he made a shield out of cardboard from a large box and covered it in tin foil and put a design on it. He actually wore that costume for two years in a row. Our girls typically like fancier costumes, so we tend to buy them immediately after Halloween is over at a steep discount. Our favorite stores to shop are Disney and Gymboree. I can find cute Gymboree Halloween costumes for less than $10 immediately after Halloween. Another idea is to use what you already have. If your son has a baseball uniform, why not go as a baseball player? If your daughter is taking ballet class, why not go as a ballerina? If you live in a subdivision, you likely get a lot of trick-or-treaters. The price of candy can really add up, but it doesn’t have to. If you’re a member of Sam’s Club or Costco, you can buy candy in bulk for less than your local grocery store chain sells it. You don’t have to buy expensive candy for trick-or-treaters. Instead, buy cheaper candy like suckers, Smarties, and candies like that. 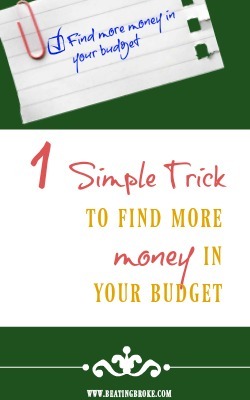 Set a budget for how much you want to spend on candy and limit your purchase to that amount. When you run out, turn off your outdoor light and don’t answer the door anymore. Halloween is a fun-filled holiday. You can still be festive without spending a fortune. 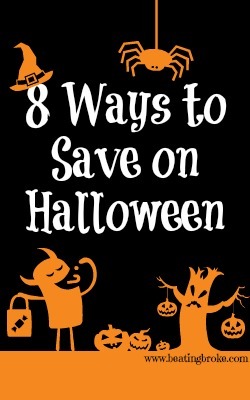 What are your favorite tips for saving on Halloween décor, costumes, and treats?